to shed light on what may have caused the dent. Adams' superstar teammate Carmelo Anthony also shared a photo of the plane on social media. In an image posted to his Instagram account, Anthony asked 'what possibly could we have hit in the sky at this time of night?' Some mischievously suggested the damage was caused by 'Superman'. BEAMS comment: Regular readers here will know that this isn't the first time something substantial has smashed into a jet; last time, in an incident involving a Chinese passenger jet, I think they cited 'hailstones' as the explanation for their pulverized nosecone; in this latest case it's a bird; yes, indeed bird collisions with airplanes do happen; perhaps it WAS migrating geese... but come on now, can damage of this magnitude ALWAYS be attributed to bird impact? I recall that there was an incident over Mexico, (a country well known for its high number of UFOs) not so long ago, where 'an unidentified object' pranged a commercial airliner, badly damaging the plane's landing gear; luckily the jet was able to make an emergency landing... but only just; it could easily have turned into a crash landing! 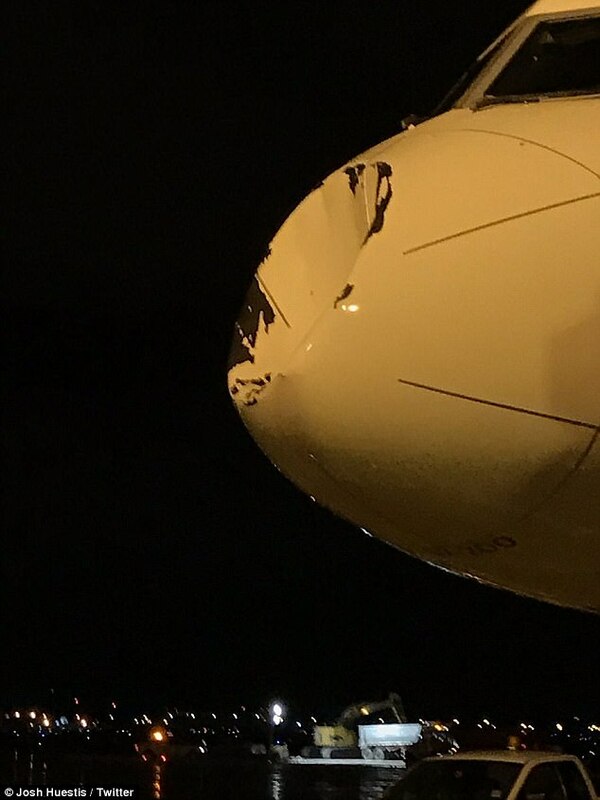 Another off pat excuse might be 'oh, a drone hit us'; but seriously, ask yourself, what would happen if a large unidentified flying sphere smacked into an aircraft head-on? it would probably cause some damage; and taking the possibility a step further, couldn't this type of UFO, (or any UFO come to that) actually be the culprit in some of these direct hit cases?